A local shop has somehow managed to snag a unit three days before the launch event. With some smartphones, it seems inevitable that the closer the launch date, the more leaky they get. Google's upcoming Pixel 3 series -- due to launch in New York next Tuesday -- is no exception, and I'm speaking as someone who had just gotten up close and personal with a Pixel 3 XL earlier today. I borrowed the phone from Hong Kong mobile shop WahPhone Digital, which is actually offering this fully-boxed device for a mere HK$15,880 or around US$2,030. Ouch. Even though this is an unreleased product, everything seems to check out: The device feels solid and well-built, likewise with its box and accessories, which include a pair of USB-C earphones, a USB-C-to-3.5mm dongle, a USB-C-to-USB-C cable, a USB-C-to-USB-A dongle and an 18W USB-C power adapter (with what seems to be an Australian two-pin plug). According to a couple of IMEI databases, this unit is recognized as a Pixel 3 XL as well. Sadly, the box doesn't provide much insight into the phone's specs. All it mentions is the 6.3-inch screen size, 128GB storage capacity, its "Just Black" design and the model number "G013C." Oh, and there's this: "Designed by Google. Made in China." On the far right, there's a hologram sticker featuring Google's "G" logo. The bottom side of the box is pretty much all blue with a white "#teampixel" hashtag -- just like the one on the Pixel 2 series' packaging. Based on some system apps that I managed to install, this Pixel 3 XL is apparently powered by Qualcomm's flagship Snapdragon 845 chipset, but oddly enough, it only has 4GB of RAM. I'm willing to bet that there's a higher-end version with maybe 6GB or more RAM. The screen resolution is listed as 2,960 x 1,440, but it's unclear what type of OLED panel is being used here -- maybe LG's P-OLED again like last time, but a seemingly improved version even when viewed under the sun. 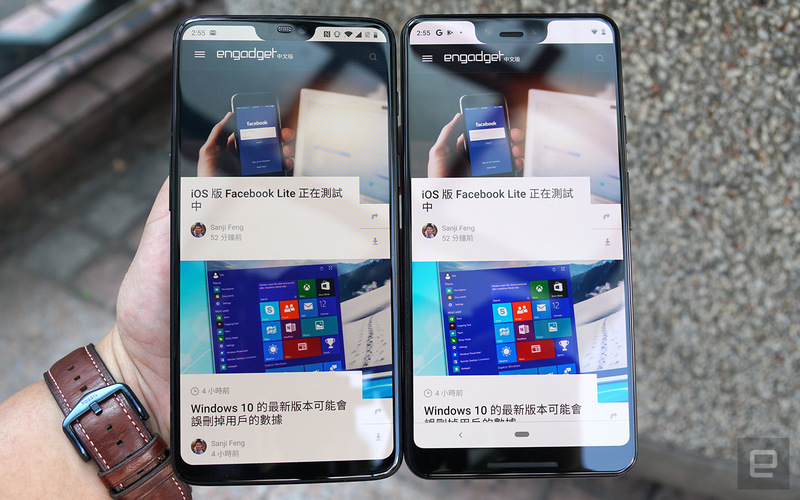 That notch though... it sure looks a little weird when placed alongside my OnePlus 6. As for the battery, the 3,732mV voltage value displayed in CPU-Z could be indicative of the cell capacity, though previous reports had pointed to 3,430 mAh. Unsurprisingly, this phone comes with Google's latest Android 9.0 aka Android Pie with gesture navigation, and it's inherited the Active Edge feature that lets you squeeze the phone to perform certain actions, such as toggling Google Assistant and muting sound alerts. It's basically the same as HTC's Edge Sense but with less customization. As for cameras, the Pixel 3 XL's camera app confirms the 12.2-megapixel resolution for the single main camera, as well as the 8-megapixel resolution for the front cameras. And yes, it's plural for the latter: It turns out that Google is taking a page out of LG's book by adding a super-wide secondary front camera. 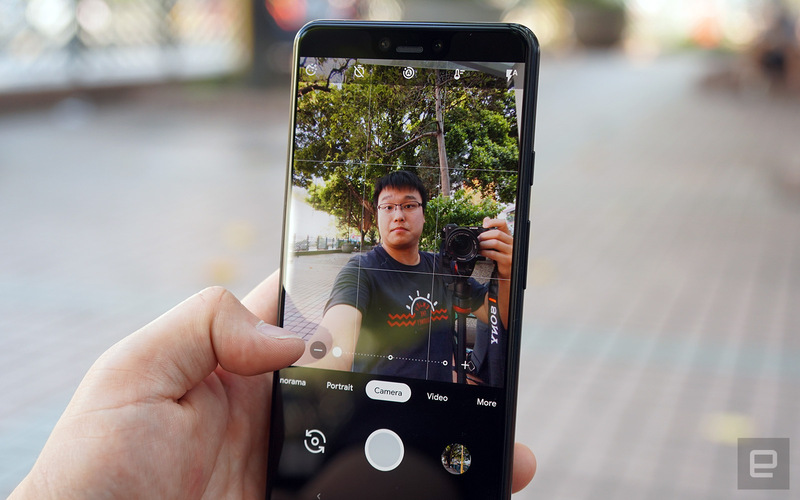 Interestingly, it seems that to Google, being able to take easier group selfies is more important than having a telephoto lens for the main camera. As for video recording, the main camera can go up to 4K 30fps, whereas the selfie camera is limited to 1080p. Even though the Pixel 3 series has been leaked over and over again over the past few months, I'm certain that Google still has some tricks up its sleeve for the New York event. Perhaps an update on the phones' impressive HDR+ tricks? Mobile aside, we're also expecting a Chrome OS tablet, a "Home Hub," a new Chromecast and maybe a few more surprises. Obviously, stay tuned on Engadget as we report the latest Google announcements fresh off the stage this coming Tuesday. Update 10/6/18 9:50PM ET: The voltage figure shown in CPU-Z does not directly translate to the battery capacity. This article has been updated to reflect this.